The history of Nine Leona Drive is simultaneously a history of a parcel of land and of the area to which it belongs. In fact, the latter—at once village, suburb, and city—may only truly be knowable through the specifics of the former. For while we may today consider Leona Drive to be part of an electoral district known as Willowdale or, alternatively, as part of the now-defunct city of North York, these names and boundaries blur in time. So much so that of the villages once known as Willowdale, Lansing, and Newtonbrook—to the histories of which Leona belongs, and of which it speaks—they existed according to the laws of landmarks, not borders. Of mills, taverns, stops on the railway. And so, a curious biography: of Nine Leona Drive. A piece of real estate that presently sits vacant in anticipation of its end. And yet, more than just its walls, Nine Leona is also the product of the embryonic processes of sub-division. So that its history is also that of the parcel of land first identified as Lot 15, Concession 1 East, originally stretching in south-easterly direction, as a 200-acre rectangle, from the corner now known as Yonge and Sheppard. 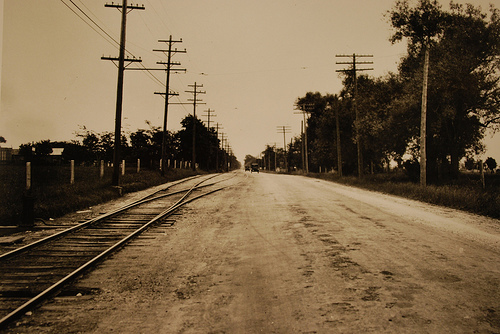 Looking east along Sheppard Ave.
Lord Dorchester, on behalf of the British Crown, “buys” 500 square miles of land from the Mississaugas of New Credit for 1700 pounds. This transaction, known as the Toronto Purchase, includes the lands that will comprise North York. Upper Canada’s first Lieutenant-Governor, John Graves Simcoe, anxious about the vulnerability of then-capital Newark (Niagara-on-the-Lake) to American strike, officially establishes the township of York on the existing settlement of Toronto. With the land surveyed according to the “single front system,” square concessions are laid out, each containing five 200-acre lots. This forms the basis of Toronto’s gridiron pattern. Property is identified according to lot and concession number; each lot is granted, for free, to able-bodied Christians willing to clear the land for cultivation and development. Work begins on the construction of Yonge Street, so-named by Lieutenant-Governor Simcoe in honour of the British Secretary of War (Sir George Yonge). The street develops northward from Eglinton Avenue, conceived as a vital military and commercial route. John Everson, owner of Lot 15, manages taverns on both of the southern corners of the intersection at Yonge and Humberstone (now Sheppard Avenue). Around this important crossroads, the village of Lansing will develop. Returning from Buffalo, to which he had retreated during the War of 1812 after refusing to pledge his allegiance to the Crown, Elihu Pease purchases fifteen acres of Lot 15, adjacent to the Yonge-Humberstone intersection. Upon this land he erects a tannery. North York radicals hold meetings at David Gibson’s farm on Lot 18, Concession 1 West, in preparation for the Rebellion of 1837 led by William Lyon Mackenzie. 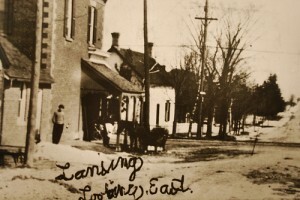 Following the failed insurrection, Mackenzie secures a horse from the Golden Lion Tavern, located on the south-west corner of Yonge and Humberstone, and flees to the U.S. The Metropolitan Street Railway Company electric car line is extended from the city of Toronto to Richmond Hill, making stops in North York. The Toronto and York Railway Company takes over the electric streetcar line and begins running it as far north as Jackson’s Point. It carries mail, people, milk, and newspapers. The train is called the Radial. It makes stops in all of the North York villages. Real estate developer Charles F. Wright, of Wright’s Ltd., begins development of the suburb of Kingsdale, sub-dividing large tracts of lands north-east of the Yonge-Humberstone intersection on Lots 17 and 18. Acting as a “wholesaler of land,” Wright’s Ltd. removes the real estate broker as middleman—selling directly to its clients both the right to build property and access to building goods, while cultivating the infrastructure (“sewers, sidewalks, water mains, shade trees”) and the community vision that would make such a prospect attractive: “We are Town Builders.” The centerpiece to Wright’s vision is a solution to “the transportation problem;” In a Toronto Daily Star advertisment, Wright’s Ltd. Boasts that Kingsdale is closer to the heart of Toronto in time (35 minutes via electric rail) than those other neighbourhoods that pay for the polluted, congested privilege of mere spatial proximity: “From the rush and the crush of King and Yonge to the freedom and fresh air of Kingsdale by [electric] car in 35 minutes.” Wright names a number of the streets in Kingsdale after his progeny: Wilfred, Lillian, Kenneth, Dudley, Doris. The Great War begins. The Duchess development falls silent. On a North York assessment map, Leona Drive appears part of the lands associated with the Duchess sub-division. For the time being, Leona Drive exists as nothing more than blue lines on a map. Ruth Sterling Gillespie (nee Smith), future resident of Nine Leona Drive, is born on August 27, near Stratford, Ontario. “Heavy Demand for Kingsdale Sub-division,” writes the Toronto Telegram. The article suggests that, after years of slow development, the individual lots in Wright’s Ltd.’s Kingsdale sub-division are almost sold out. No mention is made of Duchess (now represented by Plan 2090). On a road map of North York, in mysterious contradiction to the earlier assessment map of the area from 1923, the land on which Nine Leona Drive will one day stand is represented by a blank white space, marooned between two separate grids of streets. “Dream lofty dreams, and as you dream, so shall you become. Your Vision is the promise of what you shall one day be; your Ideal is the prophecy of what you shall at last unveil.” – poem written to Ruth Gillespie. Results of municipal referendum are made public: the TTC’s plan to construct a subway along Yonge St. is approved. The subway line will officially open in 1954. A section of Plan 2090 (itself a part of the original Lot 15) is purchased by Samuel Friedman and, via blocking Plan 3421, transformed into an autonomous sub-division. Leona Drive appears for the first time in official planning documentation, consisting of 25 individual lots for sale. On a 1947 aerial photograph, however, the land itself remains undeveloped. The Salter Construction Co. Ltd. begins to build houses. Margaret and Arthur Talbot become the first owners of Nine Leona Drive: Lot 133 of Plan 3421. The electric streetcar line on Yonge Street makes its last trip. The 401 Highway from Yonge St. to Bayview Ave. opens. The highway can be heard, but not seen, on Leona Drive. The Talbots sell Nine Leona Drive to Nayland and Ruth Gillespie, who will live in the house for the next fifty years. North York officially becomes a city. The Yonge St. strip between Sheppard and Finch, encompassing the old villages of Lansing and Willowdale, becomes part of North York’s Yonge Redevelopment Plan: the intensification of high-rise office, condominium and commercial development. Ruth Gillespie, now a widower, continues to live in Nine Leona. The deed is officially transferred to her name. As part of Yonge Street’s redevelopment,” the Garden Residences of Avondale development is initiated, on what was once the southern end of Lot 15 and the north end of Lot 14, a few blocks south of Leona Drive. Comprising over 2500 condominium and townhouse units, this development promises to offer an English garden-village experience. Ruth Gillespie no longer occupies Nine Leona; she has left behind the aforementioned book of poems, written to her by friends and classmates. Wycliffe Leona Ltd has bought up her Lot 133, as well as Lots 134-138. The developers apply to amend the zoning bylaws, in search of permission to tear down the existing homes and build a retirement complex. The North York Community Council rejects their amendment. They appeal to the Ontario Municipal Board (OMB), but are again rejected on the grounds that this area is not in need of re-urbanization. Dmitry Belopolsky and his immediate family become the last tenants of Nine Leona Drive, renting it from developers who are planning its demolition. In vacating the house, Dmitry leaves behind a copy of his 1994 documentary film Invisible Minority, which follows the stories of four illegal Russian immigrants who, like him, have been denied refugee status and face deportation. Hyatt Homes Leona Inc. officially submits plans to demolish the six houses resting on Lots 133-138, currently vacant, and to replace them with eight single-family detached dwellings. Presently, the developers are awaiting final approval from the North York Community Council. The real estate market, along with the general economy, enters a severe period of decline. Nine Leona Drive sits vacant.